This recipe for grilled peaches makes for a quick, yet rather impressive breakfast meal. And I say breakfast, but I could eat these all day. The good thing about this is that you don’t always need the juiciest and sweetest peaches. I actually prefer the firmer ones because they soften up as you cook them. Start by grilling some yellow peaches. If you don’t have a grill, you can always use a skillet over medium-low heat and cook the peaches for 10 minutes or so. While the peaches cook, make the sauce. 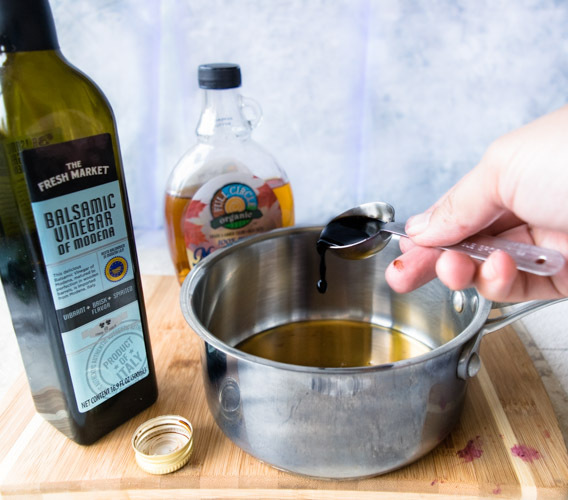 This maple balsamic reduction may sound fancy-schmancy but it’s the easiest thing you’ll ever cook. And a great recipe to have under your sleeve. 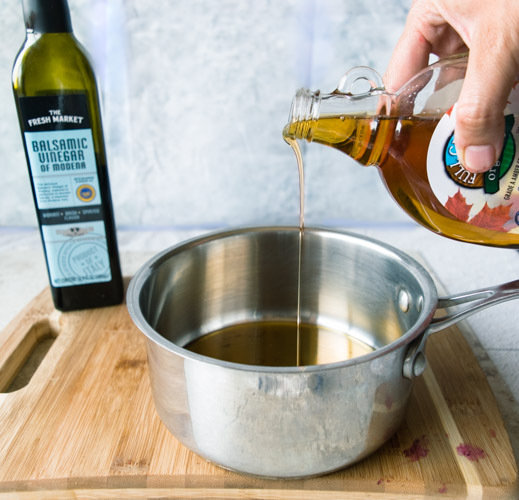 Throw some balsamic and maple syrup in a small sauce pan, bring to a boil and then reduce the heat and let it simmer for 10 minutes until it’s thickened. You can put this on everything, not just on grilled balsamic peaches. For a savory dish option, reduce the amount of maple syrup and up the amount of balsamic and drizzle over crusty bread topped with roasted vegetables. 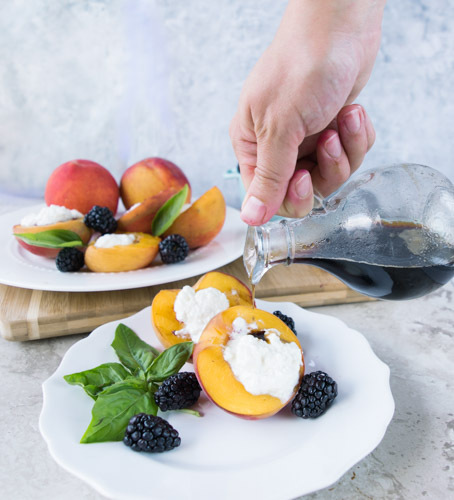 Throw a dollop of ricotta on top of the grilled peaches and drizzle with a maple balsamic vinegar reduction and you will wow your guests and most likely yourself as well! For an even bigger wow factor, make the ricotta from scratch. You can make it a couple days ahead. There’s nothing quite like homemade ricotta. The flavor is unlike anything you will find packaged at a store and the best part is, you can even make it low fat, which means less calories and less guilt. 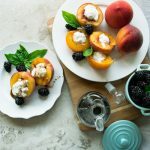 These grilled peaches balsamic are juicy, fresh and delicious! Great for breakfast or anytime! Heat a grill over medium high heat. Cut peaches in half, remove seeds and grill peaches, flesh side down, for about 10 minutes. For the maple balsamic reduction, bring vinegar and maple syrup to a boil in a small saucepan over medium high heat. Once it reaches a boil, turn the heat down to medium low and let the sauce simmer for about 10 minutes, until reduced and thick. 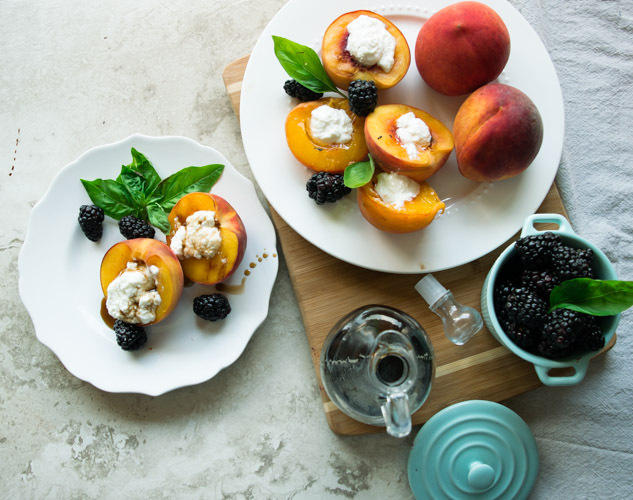 Lay peaches with open side facing up, dollop a tablespoon of ricotta in the middle. Drizzle with the maple balsamic reduction. 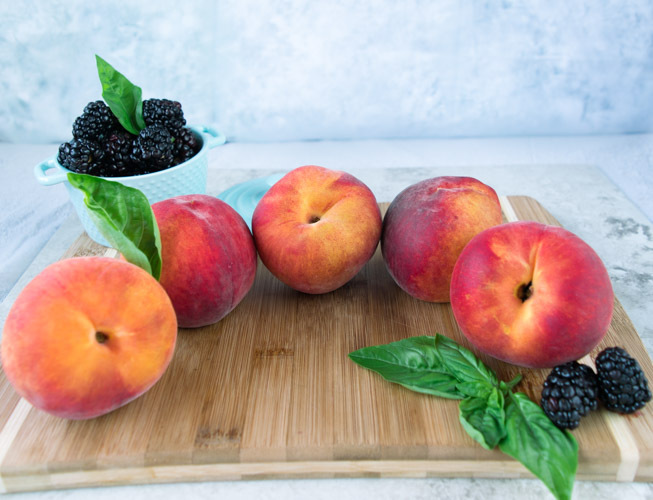 Serve with other fruits and garnish with mint or basil leaves. 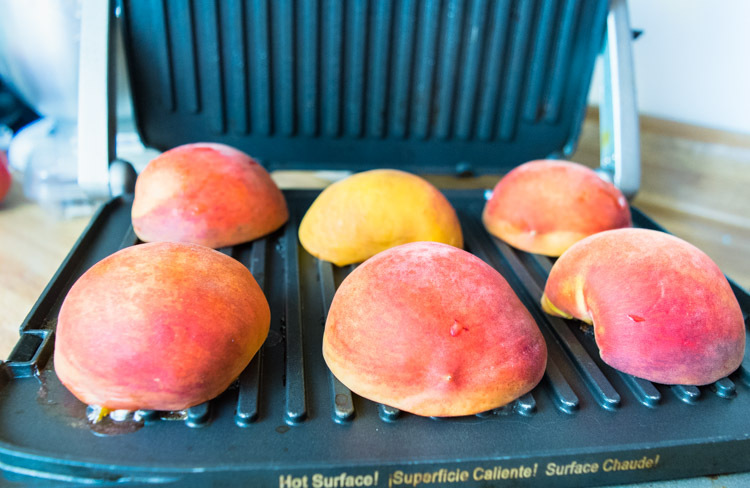 If you don't have a grill, you can cook the peaches in a skillet on your stove-top. Place the cut peaches flesh side down and cook at low-medium heat for about 10 minutes. The peaches might burn a little, but you can slice that part off revealing a wonderfully tender and perfectly cooked peach.